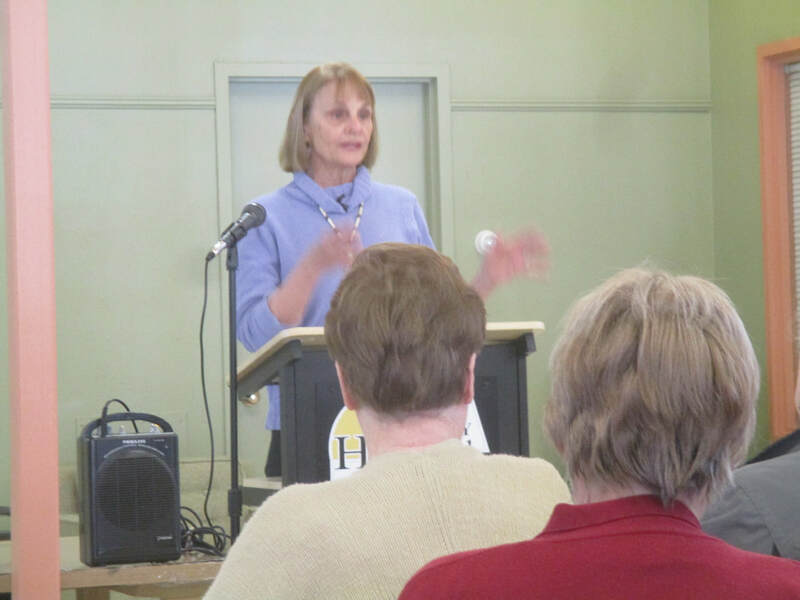 With an audience of nearly 50 CCHS members and visitors on hand, best-selling Southwestern novelist Anne Hillerman discussed the evolution of her compelling fiction writing. She also signed copies of her "Leaphorn, Chee & Manuelito" book series, including "Cave of Bones" set in the forbidding Malpais lava beds of Cibola County. She also offered a preview of "The Tale Teller," her newest title in the series - due out on April 9th. Presented by Historian & Author, Dr. Ronald Stewart, Ph.D.
On Saturday, February 9th, some 30 CCHS members and visitors were on hand for the Winter history lecture, an intriguing presentation by author Ronald Stewart on his recent book "Mysterious Explorer: Solving the Puzzle of an African Explorer in America 180 Years Before Columbus." His research would appear to have solved numerous archaeological and Spanish archival mysteries. Stewart has built an extensive case for the theory that West African mariners from the coastal region of Mali applied their advanced seagoing culture to an attempt to circumnavigate the globe - circa 1312. The Emperor Abu Bakr II, ruler of Mali, is said in some records to have reached the Americas with an exploration fleet of some 2000 ships. The fleet carried trade goods - and African elephants and camels for exploration. Validation of the Mali exploration theories in Stewart's book depends on interpretation of lithic records and artwork found in lands of Central and North America, where contact by Africans with the native cultures would have left records of such meetings. In the Southwest, widespread examples of rock art and oral histories may reveal exposure of regional native cultures to African explorers - and to their astonishing animals. Stewart's talk was supported with a variety of indigenous artwork, figurines, photos and and stone and ceramic artifacts that could support the theory laid out in his book; he also discussed such relics with many audience members. 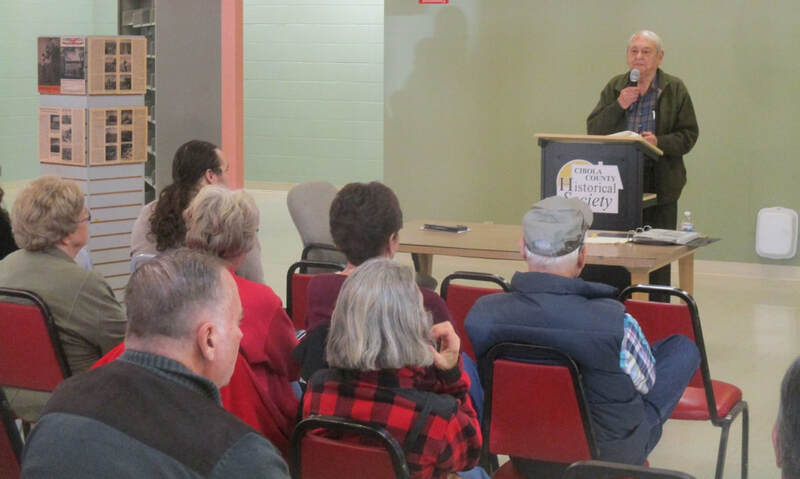 "REFLECTIONS: THE CARROT ECONOMY OF CIBOLA COUNTY"
​Paul Milan spoke to an audience of ~30 on a topic of strong interest both to long-time residents and to newcomers to Cibola. He began with a long look back to the 1880's, when the Atlantic & Pacific Railroad was building westward across the future Cibola County, and on beyond the Continental Divide. A railroad attorney, a Captain Reid, had a key role in developing the excess of public lands as granted for railroad construction. The great advantage of this area of future Cibola County was its watershed, from the ridges and valleys of the Zuni Mountains - specifically, the area watered by Bluewater Creek. As excess railroad lands became available to settlers such as Mormon homesteaders in the early 1900's, an earthen irrigation dam was built. This dam was soon washed out, and $400,000 in bonds were issued to fund a stone & concrete dam to provide Bluewater Lake water to settlers for farming the open valleys. With good soil and water, a cash crop such as lettuce was preferred, but the market demand was more suited for carrots. The first season, 1939, saw 35 carloads shipped, and 95 in the next year. The cash crop of fresh carrots from the Bluewater, Milan and Grants area was in high demand, packed in bunches with the green tops left on. Shipping to market required labor and other local resources immediately - a box factory, packing sheds, trucking, and an ice plant. But the carrot crop was hindered by periodic droughts. The discovery of underground water led to 20 wells pumping, as well as using water from the lake. The Bluewater Irrigation District sold 30 feet of water rights to the state, for creation of a recreational lake; the funds were used to pay off the bonds. Carrots were raised in the area until the late 1950's, with the last shipment in 1961. As uranium mining developed in the Bluewater region, those water rights had three times the value of farm land. Water for mineral processing eclipsed farm use - and the new uranium economy paid far better wages, as well. 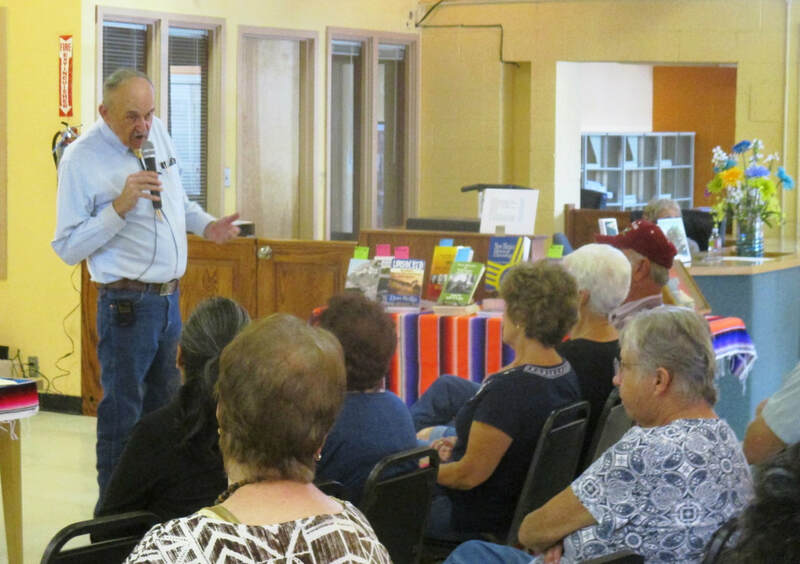 ​On August 11th, noted regional author Don Bullis presented the facts and theories on one of the most notorious crimes in the Cibola County area, a robbery and double murder that occurred at Budville, on old Route 66. Bullis has a diverse background in history, journalism and law enforcement. Retiring in 2002, he researched and wrote the novel Bloodville, on the unsolved 1957 murders of trading post / gas station operator Bud Rice and employee Blanche Brown. The station still stands, abandoned, in the little Route 66 village of Budville, NM. In addition to overcharging travelers in trouble, Bud Rice was also a Justice of the Peace, well-known for enabling many 'speed-trap' arrests, with 100 percent convictions and fines. He was popular with many in the area, but was equally despised by many who lost out in every dealing with Rice. And so, when Rice and Brown were cruelly murdered, many were not surprised. Some locals even drank toasts to his end. 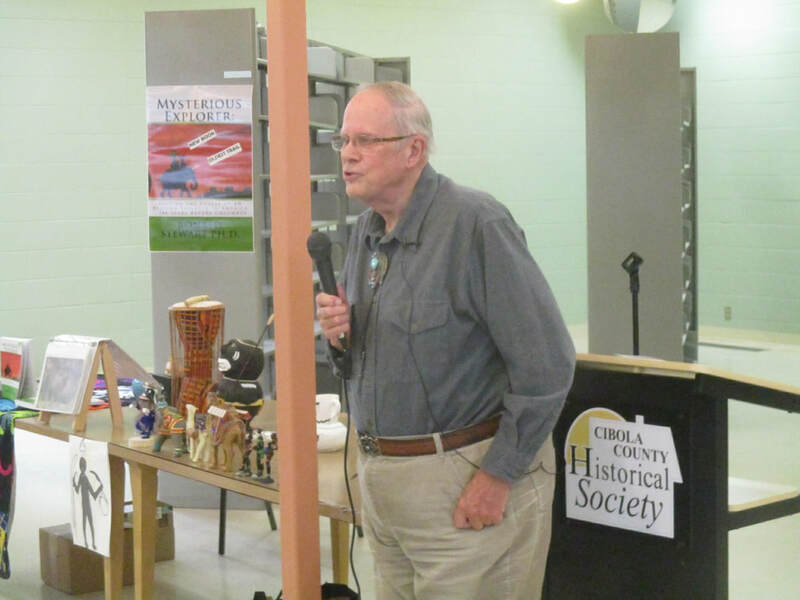 On May 12, 2018, Cibola County Historical Society held its first public history program in the new Cibola County Museum, at the former Grants city library. Some thirty people attended the program "The Michael Family in Cibola County - 1909 to Present," by Beverly Michael, with memories reinforced by her cousin, Howard Michael. Members of the New Mexico Michaels first came to the United States in 1909 from Beiruit, Lebanon. Lebanese or Syrian families had come as immigrants through Ellis Island, as early as the late 1800's. Many came west and over time settled in New Mexico. They easily assimilated into the Spanish-Catholic culture of the region in villages such as Cebolleta, San Mateo, and Bibo. Their hard work in ranching, farming and mercantile trades offered success. Many were Maronite Christians; their Spanish-speaking neighbors referred to them as "Los Arabes." ​One Michael family patriarch, who traveled home to Lebanon to marry, returned with his bride to the San Mateo area. The family prospered in both business trades and ranching. Over time, the family staked claims to grazing lands that grew to some 8,000 acres, north of San Mateo - land with good wells that also produced crops of alfalfa. From San Mateo to Grants, the Michaels branched into businesses such as a shoe store in 1955 and later clothing, trade goods and real estate. Ranching remains today as a core family business, to be passed on to the younger generation. The program ended with assorted Lebanese food specialties that Beverly had prepared. as presented by Mr. Eddie Corley, Sr. The Winter public history session featured Mr. Eddie B. Corley Sr., who described how he grew up in a Texas farming background. As a young man, Corley came west to New Mexico from a farm that has been held by his family ever since 1886 - and where he was baptized in a creek there. He had attended Prairie View College, and hoped to play football as a walk-on there. However, his aim shifted to New Mexico, where UNM offered more options for game play and for scholarships. He bought his first car in 1955 and soon moved west. However, rather than a scholarship, he found a job at the parts counter of Galles Chevrolet. Then, in 1956, he decided to try his luck in the Grants-Milan area. Early on, in Grants, he was hired as a gas station attendant by Ralph McQueary, in the days of full-service gas pumps and window washing. A short course in gas service and credit cards ended with "Can you handle it?" He recalls being treated well, and given the opportunity to learn and grow. From there, Corley settled into the area, building first one and then another home in Milan for his young family. He credits luck and faith, family and friends for the long-term success of his family's several auto dealerships. Ed Corley emphasizes the role of faith in the face of setbacks, and being an example and a guide to one's family. Despite life's problems, "we always worked it out." *After having four daughters, the Corleys finally had a son, Eddie Jr. (the couple now have 19 grandchildren).